DISCLAIMER OF WARRANTY. Materials, services and other information are provided “as is” by APSF for educational purposes only. APSF makes no express or implied warranties, including, but not limited to, any warranties of merchantability, fitness for a particular purpose or use, title or non-infringement. APSF does not guarantee the accuracy, adequacy, or completeness of any information and is not responsible for any errors or omissions or for the results obtained from the use of such information. The opinions expressed on this website are not necessarily those of the APSF. The APSF neither writes nor promulgates standards, and the opinions expressed herein should not be construed to constitute practice standards or practice parameters. Validity of opinions presented, drug dosages, accuracy, and completeness of content are not guaranteed by the APSF. This website is not intended to provide medical advice. Contact a knowledgeable and experienced healthcare professional if you require medical care or advice. You acknowledge and agree that APSF does not operate or control the internet and therefore APSF does not guarantee that the use of this website will be error free or free of technology downtimes or unavailability. You acknowledge and agree that APSF cannot and does not guarantee against viruses, worms, or other unauthorized users or hackers attempting to obtain access to this website or information transmitted to or from this site. APSF also reserves the right to temporarily or permanently discontinue this site, any page, or any functionality on this website at any time and without notice. LIMITATION OF LIABILITY. In no event shall APSF be liable for any direct, indirect, special, consequential or monetary damages, including fees, and penalties in connection with your use of materials posted on this site or connectivity to or from this site to any other site. GOVERNING LAW. You agree that any claim or dispute relating to the APSF website or your use or reliance on this website shall be construed in accordance with the laws of the State of Indiana without regard to its conflict of laws provisions. The parties agree to be bound and shall be subject to the exclusive jurisdiction of the local, state or federal courts located in Marion County, Indiana. USER NAME AND PASSWORD. In the event you access any part of the APSF website requiring a User Name and Password, you are solely responsible for keeping such User Name and Password strictly confidential. CHILDREN. The content of our website is intended for use by adults. If you are under the age of 18, please consult a parent or guardian for help in using this website. INBOUND LINKS. You may not, under any circumstances, establish a link to the APSF website without the express written consent of the APSF, including but not limited to deep linking. 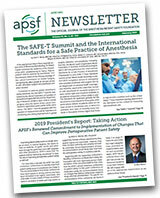 Copyright © 2010 Anesthesia Patient Safety Foundation. All Rights Reserved.